The Black Eyed Susan Rudbeckia is a wonderful, stiff upright flower that is stunning and will definitely grab your attention. 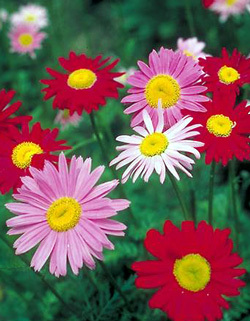 The Painted Daisy is a bushy, long stemmed annual that produces plenty of colorful, painted-like daisies in the early summer! The Picotee Cosmo is a newer variety that produces cream colored petals that melts to rosy red edges that is absolutely stunning. 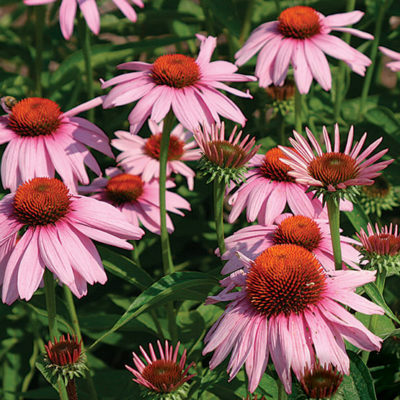 Coneflowers are some of the easiest and most rewardingflowers you can grow. They attract birds and butterflies and can be cut and brought inside where they last a long time. all the dead blooms. Coneflowers are a very hardy flower and will survive the first light frost. Coneflowers reseed themselves and come back every year. Purple – A sturdy perennial that is native to the Midwest and will reseed itself. White Swan – A coneflower that produces pure white petals with an orange-brown disk. Yellow – A beautiful coneflower that attracts butterflies in June and small seed eating birds in the fall. Geraniums produce a nice bushy, upright habit with multiple, globe shaped flower heads. rst leaves are seed leaves), remove from plastic cover. Allow seedling to grow for a couple weeks and then transplant each seedling into its own pot. Keep soil moist and supply 12 hours of sunlight a day. Pinch off the top of plant once it’s growing strongly. This will promote branching and full growth. Mix Maverick – A colorful variety that is excellent for high density growing. Red Maverick – A vigorous hybrid that blooms big, red flowerheads. Growing Impatiens yourself is a great money saver and fun experience. 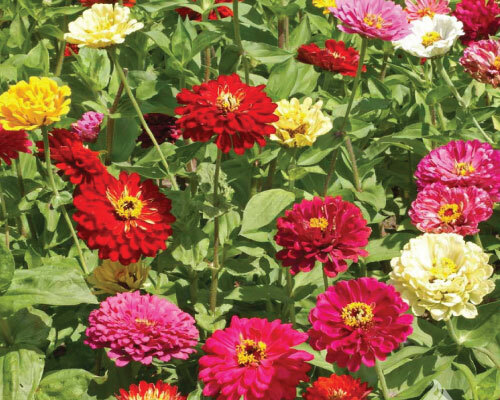 The annuals bloom bright, bold colors that adds a pop to any shady area in your garden. 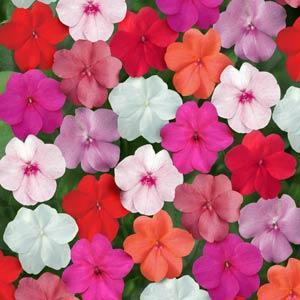 The ideal time to plant your Impatien seeds is 10-12 weeks before the last frost date of your location. Fill your pots with sterile seed starting mix and wet the soil. Place two seeds in each pot and cover with 1/8” of soil. Once the seeds have been planted it is important to cover the pots with plastic bags to keep the moisture in. Impatiens need grow lights or indirect light from a window. The soil temperature should be 70-75 degrees for maximum germination. Impatiens can sprout in as little as 7 days but can take as long as two weeks. If the temperatures are cooler it could even take longer. Be sure to remove plastic wrap as soon as the seedlings germinate. Impatiens are susceptible to fungal disease so be sure not to over water. When plants are adequate size they can be transplanted into your flower garden. Wait until all danger of the last frost has passed and be sure to harden the Impatien plants before transplanting. Mix – A tried and true variety that offers improved yield potential of an array of stunning flowers. Marigold plants are beautiful and easy to grow throughout the United States. They come in a multiple of colors, but orange hues are the most prevalent. Marigolds are easily grown from seeds in your flower garden. 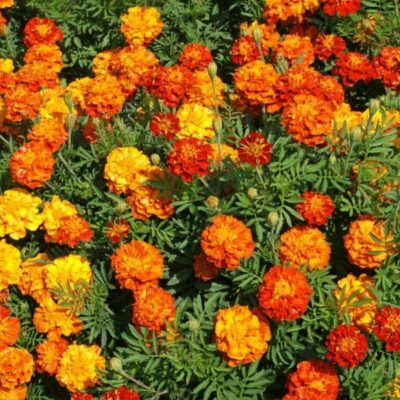 Marigolds can be grown inside 6-9 weeks before your last frost to get a jump start on the season. Starting indoors will ensure high germination and plant success. This also helps with proper spacing without the need to thin seedlings if directly sowed. After sowing seeds in soil cover lightly with 1/8” of moist soil. Be sure to water generously once after sowing. Seeds will germinate and grow quickly once sprouted. Give your Marigold plants at least 6” to “8 apart for dwarf varieties and a good 12” to 24” apart for Giant Marigolds. Marigolds love full sun and rich, well-drained soil. Add general purpose fertilizer once a month. 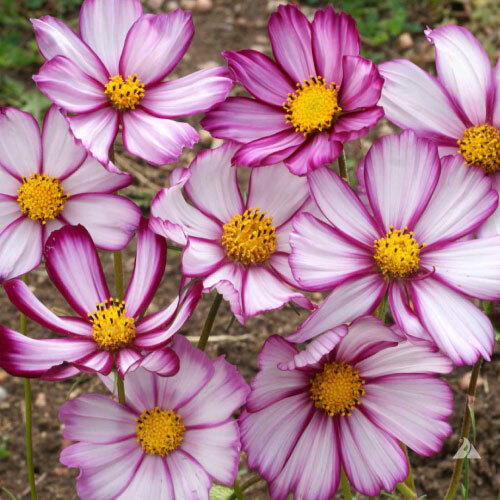 Petite Mix – A dependable flower for short season gardens that produces continuous blooms. Sparky Mix – This French Marigold is a medium sized variety with wavy petals. Crackjack – A festive variety that produces large, bushy blooms on tall stems with vibrant colors. Poppy flowers are another flower garden favorite that grab attention and are fairly easy to propagate and care for. 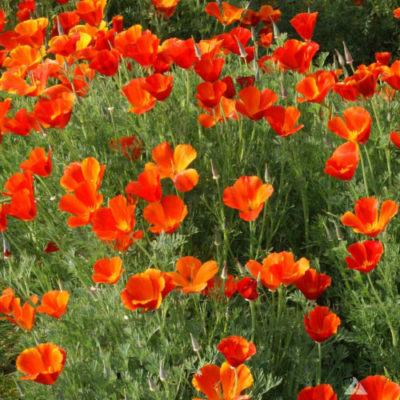 Poppies come in a variety of colors and sizes so find varieties that work best for your flower garden. you can de-head them and save the seeds for the next growing seasons. You can also let them fall when ready and you will have poppies early the next season! They will need to be thinned as natural sowing does not offer exact spacing. Great Red – A very popular giant variety that blooms brilliant, bright red flowers. The Rudbeckia flower can be grown in almost every state. These bright yellow, daisy-like flowers can grow 24”-36” high and are excellent to use for indoor flower arrangements. Theseflowers can be started indoors or out. Its best to start indoors 6-8 weeks before the last frost date of your location. Cover with 1/4” of moist soil and water occasionally. 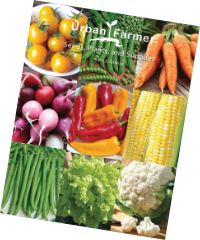 When starting or transplanting outside choose a location that receives full sun. 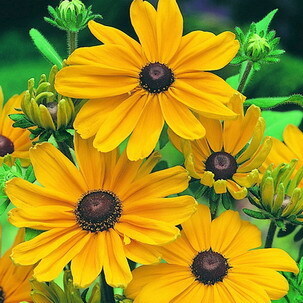 Rudbeckias are very hardy and can survive in almost any soil conditions. If direct sowing into your flower garden sow 2 weeks before the last frost date. The best way to extend the flower blooms is to remove the dead flowers which will help direct more nutrient to healthy blooms. Most Reudbeckias are perennials that will come back every year. Be sure to plant where they have adequate room to grow for years. Goldstrum – A stunning, sun-loving golden flower that is highly popular for landscaping and as a cut flower. 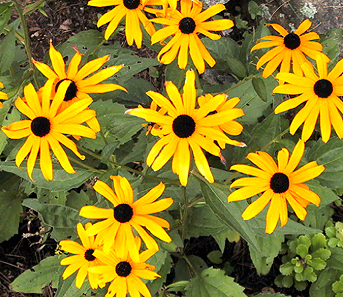 Black Eyed Susan – A wonderful, stiff upright flower that will definitely grab your attention. Indian Summer – A golden-yellow variety that produces single and semi-double large blooms.